Disclaimer - This is a sponsored post for SheSpeaks/Luvs. I cannot tell you how excited I am to be near the end of my diapering career! I have had at least one kid in diapers for five and a half years! For 16 months I had three little diaper butts to change in my house, it was never ending! But now I have only one kid who wears a diaper, and that is only when he sleeps, and yes it's as wonderful as I imagined it to be. Diapers changes are part of life when you have little kids in the house. Every parent is looking for two things when it comes to diapers; a great price and a great fit. Luvs created a super absorbent diaper. When you see the blue seal on the Super Absorbent Leakguard boxes you'll know that they are a special version of Luvs, found at Walmart. The new leakguard diapers are 15% more absorbent than other Luvs! No more worrying about leaks in the night with the new Super Absorbent Leakguard diapers. They also have a contoured shape with leak barrier leg gathers, for a snug, comfortable fit. The diapers absorb even more than the other Luvs diapers and they will keep your baby dry. Luvs always fit the great price part of the diaper equation. My son wears a size 5 and 92 diapers are $19.77 at Walmart. Combine that great price with a diaper that is 15% more absorbent and you have a great deal. 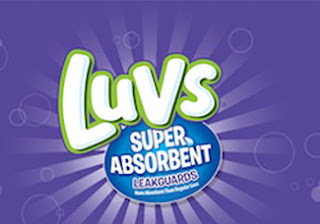 Want a chance to win a pack of the Luvs Super Absorbent Leak Guard diapers and a $25 WalMart gift card? You can enter to win on SheSpeaks website. And make sure you follow Luvs on Facebook and Twitter so you can stay up to date with promotions and information.